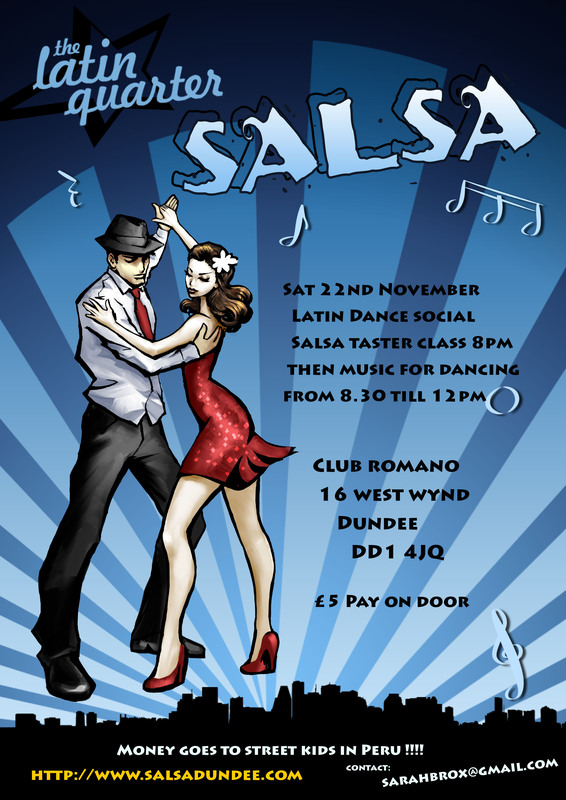 Latin Quarter latin social, sat 22nd Nov, 8pm till 12pm @ Club Romano, 16 West Wynd, Dundee DD1 4JQ ( just off Perth Road, near Dilsee restaurant) If you’re new to Latin Quarter, its a latin night with music to dance to with a free beginners salsa class at 8pm. Pay on the door £5, all money raised goes to help the Azul Wasi street children project in Peru. See charities tab on website for more details about Azul wasi. Please pass the word, pop up a poster if you can. There will also be a raffle on the evening, come ans spice your life up with a little latin spirit, anyone welcome, bring friends & family too.